My mother was never much of a hugger. A pat on the back at the airport maybe. Sideways squeeze at a party. She preferred waving. Now when she hugs me, her whole body presses tight, her whispery cheek soft against mine. She’s so tiny. Loose skin on sharp bones. Frail hands clutch my back. She was a quick-witted woman, my mother. Always eager for an intellectual spar. Kept a party moving. Filled lulls with conversation launchers. “Do you think Nixon thought of himself as a misunderstood hero?” When all else failed, there was the piano. She could make wallflowers sing. As a teenager, I tended to fall silent around her. Slipped between the wedges of words, never nimble enough for the flashes of openings. Not clever enough for counterpoints. How I must have confounded her. We were on two different planes, she and I. I would have been happy with a hug. Instead, we learned to tiptoe dance around each other. I moved to the West Coast after college and kept my visits home brief and far between. She only came to Oregon twice. Both times, she raved about the rocky coast, the waterfalls, and mountains. “What a glorious place to live,” she said, surveying the treetops from our deck. “Heaven.” But I could never get her to come back again, and eventually I stopped asking. It’s been five years now since she was diagnosed. “Probable Alzheimer’s,” because the only definitive test is postmortem. Five years since my sister and I swept in like flying monkeys and lifted her out of her life. Set her up in an assisted living facility, where we did our best to recreate a two-room version of Mom’s stately St. Louis home. “I think I’m losing my mind,” she admitted to me once. I started flying in from Oregon every six months to help put things in order. One time my sister joined me, and under the guise of a happy reunion, we donned old gingham aprons and went on a cleaning spree. Beth has a knack for turning a daunting project into a lark, and before long we were wearing lampshades and scrubbing the kitchen while dancing to show tunes. 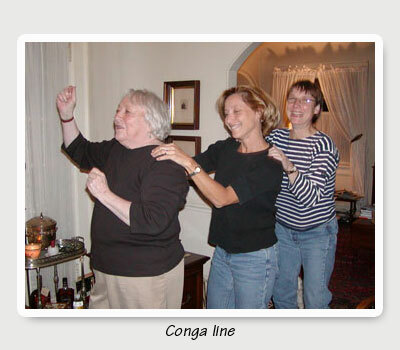 Mom joined us in a conga line and didn’t even notice us sneaking piles of clipped articles and endless sticky notes into the trash. By the time we left, we’d stacked forty-one bags of garbage at the curb and had taken even more to recycling. The deep grain of the old oak dining room table gleamed, but we’d barely made a dent in what was quickly becoming Miss Havisham’s mansion. Not long after that visit that I got a call from Mom. “I’m sitting here in the dark, and I don’t know why.” The electricity had been shut off after she’d forgotten to pay the bill. “It’s not safe for you to keep living all by yourself with no one around to help you,” I insisted after setting up her bills on auto pay. 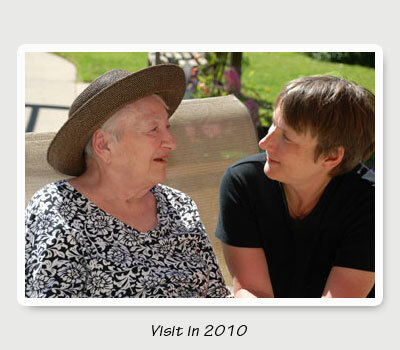 Beth and I both looked into retirement facilities near our homes, but Mom would have none of it. 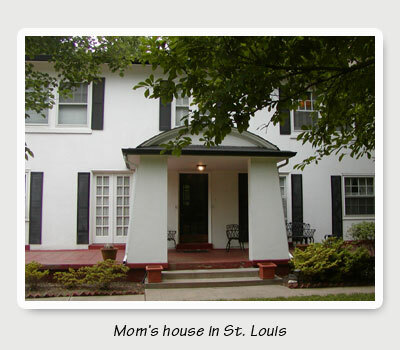 On my last visit to St. Louis, Mom wasn’t at the airport to pick me up, even though I’d called from my stopover in Phoenix to remind her. When she answered at home, she suggested I take a cab. Every room was piled with newspapers and magazines. Bulging Walgreens shopping bags slumped in corners, covered chairs and surfaces. The dining room table was heaped again with unopened mail–literally three feet deep. The answering machine blinked with dozens of ignored messages. Fortified by each other’s presence, we shifted into high gear, tackling the mail mountain first. Among the usual subscription and credit card offers, we found a letter revoking her driver’s license, lapsed car registration, auto insurance cancelation, overdraft alerts, unpaid bills, delinquent tax notices, and a year’s worth of uncashed dividend checks. We took Mom to her doctor, who ordered a CAT scan and told her she could no longer drive or live alone. 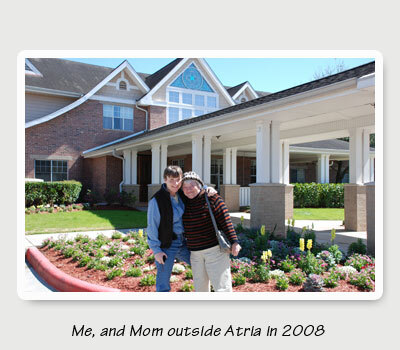 We had power of attorney papers notarized, met with her accountant, set up new bank accounts, and arranged for Mom to move into an assisted living facility near Beth. We thought she would fight it, this sudden evacuation. Leaving her birth city, friends she’d grown up with. But by then the full, cultured life she’d built for herself was in tatters. After all those years of stubborn resistance, she relinquished control with gratitude. Seemed eager for a fresh start. And she donned a personality we’d never known, childlike and docile. “Oh, will we get ice cream when we’re done?” We could have been packing her for summer camp. Atria Senior Living was filled with old people. Hunched and shuffling with walkers. Some in wheelchairs being spoon fed. Stroke survivors struggling to communicate. “Mom doesn’t belong here,” I whispered to Beth when we first arrived. She was way too young and vibrant. This place was depressing. But Mom greeted her new neighbors with enthusiasm and grace. She was thrilled that her “apartment” was next to the courtyard. “I’m so lucky,” she’d say, several times a day. “I have such a good life.” And somehow, just by saying it, it was so. 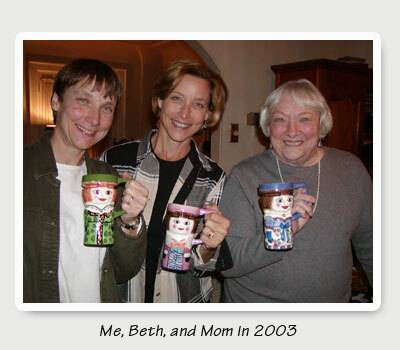 Beth settled Mom in, and I returned to St. Louis to undertake the dismantling of my mother’s three-story home, filled to bursting with valuable antiques, unopened purchases, squirreled junk, and rotting food. Thirty years of accumulation. Three generations of heirlooms. As hard as we had worked, the task ahead was so much larger. I walked through the rooms of the century-old colonial with the intention of taking inventory. What to keep, sell, or give away. What to fix. The house’s neglect was obvious. Broken towel racks, dripping faucets, stained carpets, walls blistered with water damage. Everywhere there were hints of the private hell my mother must have been going through. Daily lists and reminders. Post-its everywhere. Detailed notes on phone conversations. (No wonder she could rattle off so easily what each of us had been doing.) Stacks and stacks of new books all bookmarked within the first chapter. She must have known for some time what was happening, her mind at war with itself. And she had worked so hard to cover, to compensate. This was when it hit me. A tidal wave of memories and regret. Grief big enough to smash that wall of competence I’d been holding strong. Alone in that big house, I could wail. Back at Atria, Mom was adjusting nicely. She ate well, made friends, went on weekly outings, and bragged about her bingo winnings. “Oh, yes. Your mum, she never misses a game,” the Jamaican aid told me. “She’s the life of the party around here. Always dresses so pretty. Everybody loves your mum.” But mum had convinced them all that she was more capable than she really was, and when she got lost one day walking to the drugstore, we moved her to a facility specifically for Alzheimer’s patients. At Silverado, she shares a small room with a congenial woman who calls her by the wrong name. Mom wanders the halls a lot, confused. And she hardly ever remembers to put in her teeth. My heart split open. What was she saying? Did she really want an early out? I grappled with her words. Not that I really could do anything to help her. Here in Oregon, assisted suicide is legal, but to qualify, you must be of sound mind and failing body. Not the other way around. Even if you could designate a stage in the future at which you’d like to be eased away, by the time you reached it, you might feel differently, and who would win–the person you were or the person you are? Who would get to decide? Alzheimer’s is a slow and callous killer. It could be another five years for Mom. She will forget who we are, how to walk or talk, how to move a spoon to her mouth, and eventually how to swallow. No “death with dignity” here. We can hope for a heart attack. 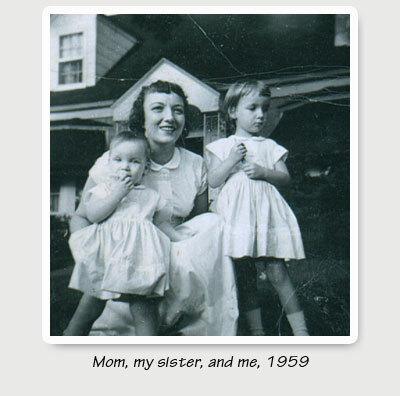 As I held Mom’s hand, I wished I could spare her the worst to come. But I knew I could never hasten death for her. How could I live with that? She still remembers us kids, if not the grandkids. But even the favorite memories she used to recollect, over and over until we thought we’d go crazy, are lost to her now. “Remember when Kennedy died and we drove all night to D.C?” I prompt her. “We stood in the freezing cold at five in the morning to save our place on the curb so we could watch the funeral procession?” She looks at me like I’m speaking another language. With the diminishing of her brain function, however, her heart has come forward at last. One by one, the crustier layers have peeled away, and I’ve found the mother I’d always missed. She can’t play Scrabble with me, or talk politics, or even ask about my family. But when she sees me, she opens her arms, and her eyes are full of love. If Old Mom were here, watching over us, she’d be appalled. And maybe she’d rail for mercy. But New Mom is just fine for now, and I’m grateful for this second chance we have. When I touch her shoulder, instead of flinching, she leans in for a hug. © Jennifer Meyer. To reprint, please ask for permission.